Justice for Sheikh Mansour – sign the petition! Comments Off on Justice for Sheikh Mansour – sign the petition! Ali Leghaei – Sheikh Mansour’s son – has started a petition, asking the Australian Minister for Immigration to accede to the directions of the United Nations’ Human Rights Committee (UNHRC) by reassessing his father’s case. Click here or the pic to sign the petition now. 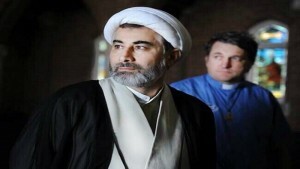 The October 21st deadline has past and the Australian government has not responded to the United Nations Human Rights Committee regarding their treatment of Sheikh Mansour Leghaei. You can pick up a PDF version of Ben Saul’s paper here. 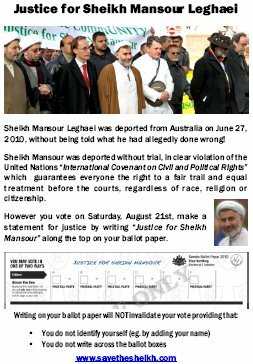 June 3rd, 2010 – over 1000 of us gather at Parliament House, Canberra, to protest the pending deportation of Sheikh Mansour Leghaei. Sheikh Mansour is to be deported without trial. Despite living peacefully for 16 years in Australia and raising a family of four children, the government is deporting him without giving him any explanation.